Technical leads of the Africa RISING project in West Africa, East and Southern Africa, and Ethiopia, took part in a cross-learning tour on sustainable intensification from 28 January to 3 February. The event was organized by donors funding projects on sustainable intensification in Africa and South Asia. A diverse and multi-institutional group of 50 participants attended the event and shared perspectives on sustainable intensification in African and South Asian contexts. They came from USAID, Bill & Melinda Gates Foundation, USAID’s Sustainable Intensification Innovation Lab, the Innovation Lab for Small-scale Irrigation, CIMMYT, International Food Policy Research Institute (IFPRI), International Livestock Research Institute (ILRI), and International Rice Research Institute (IRRI). Participants visited sites of CSISA in Bihar and Odisha States of India. IITA scientists who took part in the event were Irmgard Hoeschle-Zeledon, Mateete Bekunda, and Asamoah Larbi. 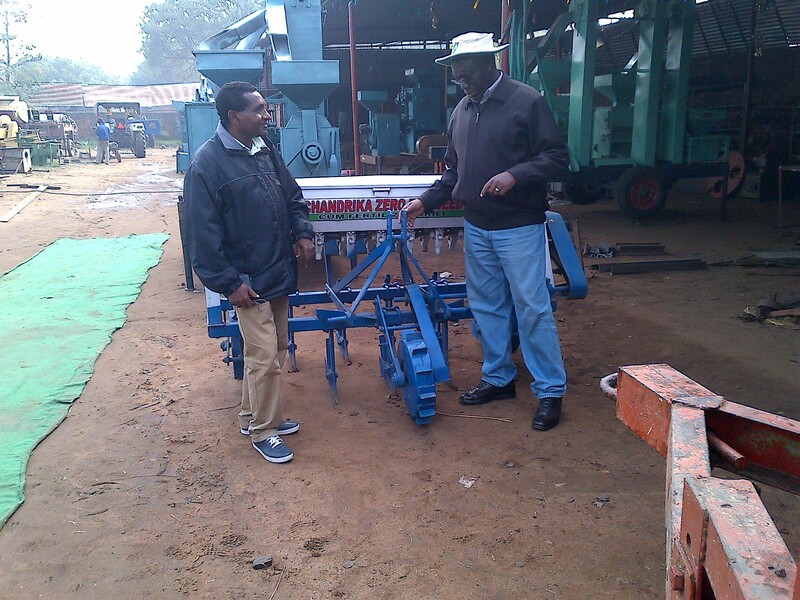 Africa RISING scientists Mateete Bekunda from IITA (right) and Kindu Mekonnen from ILRI (left) look at a mechanical seeder manufactured for use by small-scale farmers in India. The mechanical seeder is manufactured through a public-private partnership between the Cereal Systems Initiative for South Asia (CSISA) and the private sector. “Taking part in the cross-learning event provided insights for us on the work of our colleagues. We could clearly see how government’s subsidies help the adoption of technologies. Although we cannot change government policies in Africa, we have seen a lot of affordable and feasible options for the mechanization of smallholder farm activities which we can introduce in Africa and which will be beneficial to small-scale farmers. Examples are the use of two-wheel tractors for line sowing and fertilizer application, fodder choppers, and axial flow pumps. We invite our CSISA colleagues to come to visit our activities and give us advice, based on their advanced experience in India,” said Dr Hoeschle-Zeledon, Project Coordinator for Africa RISING West Africa and East and Southern Africa. Prof Mateete Bekunda, Chief Scientist of the Africa RISING East and Southern Africa Project, noted that such exchanges between sister projects in different parts of the world are beneficial for partners engaged in sustainable intensification projects to learn from each others’ experiences , refine project implementation, and consequently improve the livelihoods of the smallholder farmers. As part of the US government’s Feed the Future (FtF) initiative to address hunger and food security in sub-Saharan Africa and South Asia, USAID is supporting three multi-stakeholder agricultural research projects under the umbrella program Africa Research in Sustainable Intensification for the Next Generation – Africa RISING. This is designed to sustainably intensify key African farming systems in West, East, and Southern Africa (led by IITA) and in the Ethiopian Highlands (led by ILRI).